Title: In Medias Res: Liturgy for the Estranged Author: Catherine Madsen Imprint: The Davies Group, Publishers soft cover 152 pp. 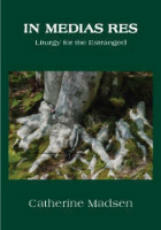 USD 20.00 ISBN 978-1934542019 June, 2008 For readers skeptical about religion but drawn to ritual, In Medias Res offers a liturgical cycle for the seasons and for life passages, sketching a religion of nature in which nature is vulnerable to history. Unlike many books of ritual for skeptics, the focus is not on rational statements of belief but on artistic coherence – language and action that will continue to yield meaning over time. An unusual synthesis of original and quoted material, religious and literary sources, intellectual breadth and emotional intimacy, In Medias Res presents both a performable body of ritual and a valuable method for liturgical writing. Contents Introduction: Prometheus Stealing Torah for the People: Notes Toward New Liturgy Notes on the Form and Performance of the Rituals Part I—Seasonal Rituals Invocations; Winter Solstice; The Trees’ Praise; The Feast of Fools; Mayday; Midsummer; Harvest; Fall Equinox; Allhallows Part II—Prayers Prayers for Various Occasions; Prayers for Women Part III—Rites of Passage Naming a Baby; Coming of Age; Questions for Couples Contemplating Marriage; Marriage; Divorce; Healing; Burial Reviews “In medias res: to stand right here, for once, in the middle of the temple of things, with all our vertigo and tenderness, our unlikely desires, our eccentric hopes. Trying to remember the liturgies we need to invent, to improvise the rituals we must already have learned. For us, standing here, Catherine Madsen offers a book of unyielding beauties—and surprising comforts.” – Mark D. Jordan, Emory University “Madsen’s writing is brilliantly epigrammatic, lapidary without fussiness, emotionally charged without sentimentality, lyrical without being singsong. This liturgy neither pretends to know more of existence than we can, nor less of existence than we do: clear-eyed, unapologetic, lit by the loneliness without which there is no hope of connection, this is liturgy for grownups.” – Joy Ladin "A brilliantly orchestrated bricolage of quotations from a wide array of both secular and religious writers. A profoundly learned liturgy in the range of its ideas and the breadth of its acknowledgment of tradition, forged into a seamless, compelling whole. Madsen's work exists at the intersection of the imagination and the moral life." — Mark Doty “In a time when we are no longer sure that the earth will abide forever, we urgently need language and rituals by which we can express our concerns and sustain our hopes. Catherine Madsen’s intelligent new work offers a deep spiritual and moral aesthetic that can move all of us to act—for our own sake and for the world’s.” – Ellen Bernstein, Founder of Shomrei Adamah; author of The Splendor of Creation Author Catherine Madsen is the author of The Bones Reassemble, a critique of modern liturgical language; A Portable Egypt, a novel; the libretto for Robert Stern’s oratorio Shofar; and many essays. She is a former contributing editor to the interreligious journal CrossCurrents. Madsen , The Bones Reassemble, an interdisciplinary critique of modern liturgical language.